In 2015 and 2016, a group of locals from an Albanian village in Macedonia banded together to help hundreds of thousands of war refugees who were passing the border near their village. These men worked for hours every night to help men, women, children, the ill, and the elderly. They brought help to refugees of all faiths. They brought them food, warm, shelter, and whatever support they could. They carried their bags and babies, helped warm up frozen children, reunited families, and risked their own lives and safety to help strangers they had never met and may never meet again. They often worked all night, slept for only a few hours, and then worked their regular jobs to support their own families. They were sometimes seen about the transit camp, barefoot in the middle of the night, running here and there helping refugees, having just given away their shoes to someone they felt needed them more. The village of Studeničani sits outside of Skopje, in Northern Macedonia. It’s people are primarily Albanian Muslims. Now it’s years later, and the village of Studeničani needs help. The local school children have a lack of shoes. They sometimes have to walk three kilometers to school, through mud, rain, or snow, and without adequate protective footwear. The purpose of this fundraiser is to raise funds to bring shoes to the children of Studeničani. As funds allow, we will also provide books, school and educational supplies, and possibly jackets. Funds allowing, we will also bring this help to nearby villages and schools as well. As per our usual policies, we will purchase from local suppliers in Macedonia. 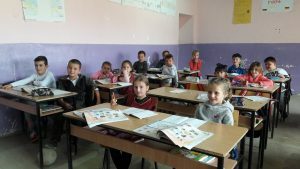 The number of students in the primary schools of Studeničani and it’s neighboring village is approximately 1700. Including students from a few smaller schools in the area, we have roughly 2000-2500 students to begin with. The estimated cost of bringing a book and a pair of shoes to each child is $10.00 or less.